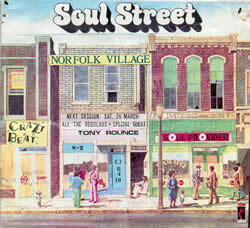 VILLAGE SOUL - Who, what when where why? In the late summer of 1975 I was presented with a challenge. I was asked by the owner of a bar in Shoreditch, in the East End of London, called the Norfolk Arms, if I would like to come and play the music there. After being told that the management of the music policy would be left up to me, I agreed and got ready to transfer from his other bar, the Sebright, just down the road in Hackney. I had spent the years since 1970 transforming the Sebright from a Rock pub that 'entertained' the odd Motown record, into a bar whose musical menu included four full-blown SOUL nights, and it would have been easy to stay there and let someone else take this on. However I was offered a full time job at the bar as well as DJing, so I accepted the challenge. The possibility of running my own SOUL venue was just too much, and the thought of indulging in my passion for the best music in the world every night I played was, frankly, too strong to refuse. The first challenge would be to get the punters that I had nurtured at the Sebright, to follow me to the Norfolk, that way we would have to core of the crowd already into the music that I loved. Although the bar had to be refurbished I began three weeks before that began in late September 1975. The pub was split into 3 bars and not conducive at all to entertaining a crowd, and the first night I spun there, the crowd consisted of 2 old ladies, a man and his dog. Although they slept through most of my set, I do believe they enjoyed the Aretha segment (you knew there would be one even then didn't you.... :>) so I was not too dismayed. The refurbishment happened and little over a month later, the pub opened officially, with just one big bar, and I was relieved when the SOUL crowd turned up to make this their new home. I had requested that the DJ box be placed where I could see every corner of the bar, and, as in the Sebright, that it not be raised but be at floor level, so I could get involved in the atmosphere that I hoped to create. 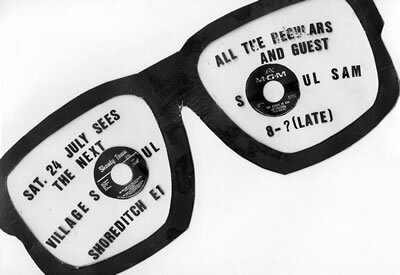 We began in earnest and Thursdays became the 6ts sessions, with the accent heavily on Motown, Fridays everything from 6ts to new releases and on Saturdays I played mostly 7ts endeavouring to add 'different' types of SOUL to the all conquering disco scene that was sweeping all in it's path at the time. Early 7ts Philadelphia and Chicago tracks were some of the strongest battlers against the crass disco tunes and artists like the Spinners, Harold Melvin & The Bluenotes, Tyrone Davies and Garland Green became allies in refining the musical assortment. 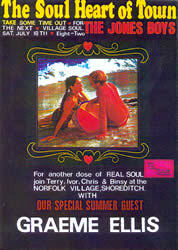 The crowd steadily grew and began to include well-known faces from what was then the underground SOUL scene in London. 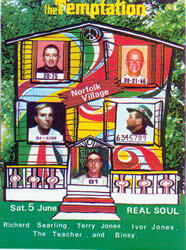 Regular visitors included Chris Forrest, a Motown fanatic, who I had met at the Sebright and who had become one of my closest friends, and it would be Chris who would join me in promoting the Village, as it was about to be re-named, and who would also be instrumental in getting me to leave my London roots in the late 8ts and join the nationwide SOUL scene that was out there and make a name for myself outside the capital. 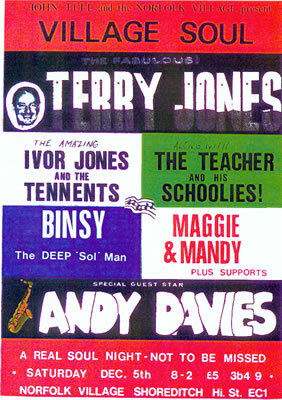 Other regulars in the early days included Blues & SOUL columnist Sharon Davies, Record Corner supreme Terry Davies (no relation) and Tony Rounce, a well-known character on the SOUL scene, who I had worked with for a time at P & J Records in Hackney. This guy possessed the most musical knowledge by far of anyone I had ever met, before or since, and 30 years on, I'm glad to say I retain the utmost respect for him, and we remain good friends. 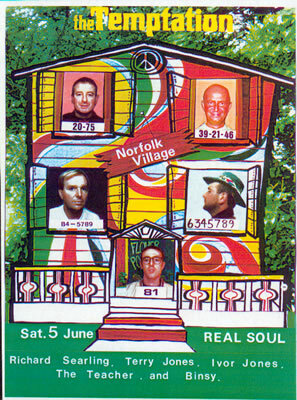 It was Tony who actually designed the 1st ever Village flyer. It was the general opinion of the punters at the bar, more people should know that the Village existed, as it was considered by many to be the Home of Real SOUL Music in London and the 'faith' should spread. With 'faces' like these and many others 'in the know' in attendance, the Village was becoming the place to go in London on a Friday night, if you wanted to hear real SOUL music. I could sense something special was happening here. 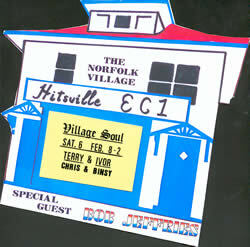 All through the 8ts, the Village continued to fill up each Friday with some of the most knowledgeable SOUL punters around, and was now attracting the Goldmine & Caister Weekender crowd, as members of a number of the SOUL 'tribes', notably Neil Adkins, Taffy, Billy & Paul, adopted it as their London home every Friday night and were ardent supporters of both myself and the venue. Well-known faces continued to visit the bar as the notoriety spread. David Grant from the jazz funk band Linx, had his stag night at The Village, with Junior Giscombe, Light of The World's manager Joe Williams included in his huge entourage. Bill Fredricks from the Drifters was seen propping up the bar, and one week Odyssey turned up with Sharon Davies, to drink champagne with the punters and give away signed copies of their hit single Inside Out. During this time, a massive 'across the board' play list containing something from all eras (ring a bell?) had been built up at The Village in an effort to keep the music fresh. Also, having to play a solo 6-hour set each Friday meant this was crucial to keep me interested as well as the punters. It was around this time in the mid-8ts that I was also running another bar up the road called the Spreadeagle (another story) and I was beginning to get so immersed in business that it was impossible for me to give the music the attention it deserved. I eventually decided to sell the 'Spread' and get back to The Village full time. It was then that Chris Forrest suggested that I take some time out, go to the SOUL Weekenders up north and get my enthusiasm back. This worked wonders and once again I was hooked. I delved into my collection and once again pulled out those forgotten tunes that I had heard once again at the weekenders, realising that there was a definite chance to attract those punters that I had met up north who had never heard of The Village. I concentrated more on promotion, having flyers for one off nights and gaining a much higher profile. Promoters began to see The Village in a different light and began to approach me to bring their artist down to entertain. Al Johnson was perhaps the highlight at this time, when he came down and proceeded to rehearse for his up and coming Southport date. 200 enthusiastic SOUL punters clapped, cheered, stomped their feet and sang to every song, while Al, using me and a cassette deck as his band and backing group was blown away. Such was the impression left on this great SOUL singer, that on stage the following week at Southport, he told the crowd, 'if you think this is good, you should have been at The Village last week, now that was awesome.... nuff said. Al encouraged other SOUL friends of his to come to The Village after, not just to sing, but to hang out, as he knew that they would all be made welcome and be amongst friends. On one occasion, Clifton Dyson, Al Mason and Rick Webb all came on the same night and entertained the crowd for 2 hours, it was an incredible evening. A large section of the regular punters, or the 'Village Choir' as they were now known, were in such good voice that evening, signing to everything, before, during and after the 'show', that they impressed Al Mason so much with their rendition of Corey Blake's How Can I Co On Without You, that he recorded it for his next CD which was released a few months after. This trend of artists appearing carried on and Rick Webb became a regular visitor, sometimes turning up with a hold-all full on his latest CD singles, or sometimes just coming to hang out with the fans. One time he brought with him, fellow DC recording artist Desi, who took the mike for a great rendition of his independent hit Together Forever and a few others besides, on reflection, these really were unique and magical times. In the latter part of the 8ts, Colin Johnson & Peter Blacklock, a couple of punters from Durham in the North East of England, who had become regulars at The Village while working in London, asked me for a tape of one of the Friday sessions. Unbeknown to me, they took it to Alex Lowes, who ran the Up-North Weekenders who then called me to ask if I would like to be a guest of Richard's on the Saturday afternoon Connoisseur's Sessions at Southport. Of course I jumped at the chance and so began, not only a great friendship with Richard but also a regular place on the bill at Southport, which led to other residencies and gigs all over the place, and the rest, as they say is history. I do owe a big hug of gratitude to both Colin & Peter, 2 of my biggest supporters, for lighting the fuse, and of course Richard for helping me gain the respect and trust of the punters up north. Because of the popularity of the Fridays at the bar, we decided to re-promote the Saturdays by re-introducing the Saturday sessions and inviting well-known DJs from all over the country to spin alongside myself, Chris and other local jocks. Village SOUL, as the Saturday sessions were called was an instant success and drew an enthusiastic crowd from all over the country. A veritable who's who of top SOUL spinners came to spin. These included amongst others, SOUL Sam, Adey Croasdell Andy Taylor, Gavin Page and Andy Davies. 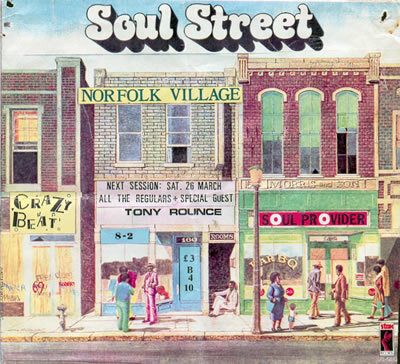 Tom Jackson, Bob Jeffries, Alan Paterson & Brian Murray from Scotland, and London's own included Ivor Jones, Tony Rounce, Dr Bob Jones, Terry Davis, Gary Dennis and Deep SOUL addict Mark 'Binsy' Taylor, who became the early doors expert at the Saturday Village SOUL. But perhaps the biggest coup of all, was getting the country's top SOUL DJ Richard Searling to join us on a couple of occasions. This to me signalled that The Village had now garnered the respect it deserved after all the years of hard work and it was indeed a proud moment for me, and on a more personal note saw the forging of a great friendship with Richard, one that had begun a couple of years earlier. Although these household names behind the decks played their part in adding to the 'legend' of the Village, it is undoubtedly the knowledgeable punters that made this venue what it was. The mix was intoxicating and included a diverse cacophony of characters, perhaps unique to the SOUL scene. One of these characters was my good friend Charlie 'Jackie Wilson' Mitchell. An avid SOUL enthusiast/record dealer who brought many a great tune to the mix at the Village, Beres Hammond, which is included on the new Village SOUL compilation probably being his greatest ever find, although there were plenty of others. My late friend and 100 Club legend Randy Cozens, Mark Houghton, Colin Brown, Ivor, Gary Thomas, Mole, the aforementioned 'Rouncey', D'arcy, Jim, Debbie Evans, Dave Halsall & Tina, Tricia, Sean Truman and the 'Essex Four', Pat, Richard, Brad, Martin and the rest of the Village Choir, Chris 'The Teacher' Forrest and brother Steve, the list is endless. There were so many punters that added to the unique atmosphere, impossible to name all, but suffice to say, IF YOU WERE THERE, it was YOUR venue, it felt like HOME because you felt AT HOME. One of the many brilliant nights that I fondly remember, and still makes me smile when I think about it, was the occasion of my 40th birthday in the May of 1992. It seemed like everyone that was anyone on the scene had turned up to celebrate (gloat) me getting old. Just before 10.30 on that evening, the bar was already packed to the gills with punters hanging off the ceiling and I was chatting to D'arcy, saying how flattered I was that so many people had turned up to 'party' and how amazing it was that they had all managed to get in. Those of you who know D'arcy will know he is a lot taller than I am, and at that moment, he glanced out of the front window of the bar and said, 'TJ, prepare to be even more flattered and amazed, 'cos there's a bloody coach outside with loads more punters pouring off it!". It was Debbie Evans with the Hemel Hempstead crowd, who smiled and said "sorry we're late mate" hope we haven't missed anything. They had missed some, but there was plenty more to come, as unbelievably, the last record was played at 7am, and as 200 odd bleary eyed, but happy, very drunk punters made their way out into the sunshine, somebody who had travelled from Manchester was heard to say " that was the best bloody all-nighter I've been to for ages!".... :>), not bad for an old boozer in Shoreditch with a 2am licence! There would of course be many all-nighters at the Village, and as the years went on, 2am came and went, with alarming regularity, God we must have drunk our share, I can tell you, ha ha. As the bar's popularity went into orbit, the music reached stellar proportions and listening to some of the old Friday tapes I still find it incredible how I managed to get away with playing so much brilliant music in that little pub in Shoreditch. We had come a long way from the 2 old ladies, the old man and his dog. The Village was now the place where SOUL punters headed for when they arrived in London for the weekend, knowing they could pick up flyers for nationwide events and being secure in the fact that they were sure to meet like-minded people who loved the best music in the world...... SOUL MUSIC. In the latter part of it's existence, The Village also became home to the legendary 'Essex' parties, hosted by Frosty & Tim Gillis, entertaining mainly the Caister punters with their own brand of music & fun, but despite everything, all good things come to an end. Tragically after 21 years of entertaining the country's SOUL fraternity, becoming undoubtedly The Home Of Real SOUL in London, and being recognised as the longest running weekly SOUL night (in the world? 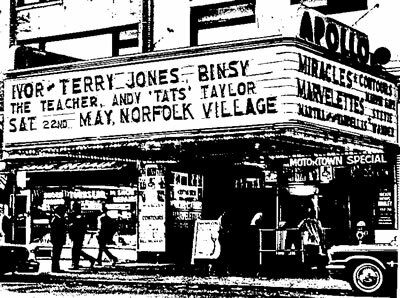 ), The Norfolk Village closed it's doors at Easter in 1996 when the venue was sold. I doubt there will ever be a place like it, certainly not in my heart anyway. People will say when the place is remembered in conversation in years to come, as I did after Angela Johnson's epic performance at the Hilton earlier this year, you may have heard about it, but you can never have really quite appreciated it, unless you could say "I WAS THERE". 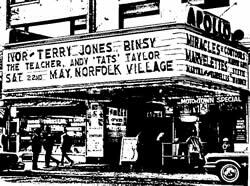 The Norfolk Village certainly deserves a place in SOUL folklore amongst the more illustrious venues up north such as the Wigan Casino, Twisted wheel and the Blackpool Mecca, just like those great venues, and the 100 club in London, it is there on merit. The natural progression from all this has been my tie up with several other SOUL movements around the country including of course Togetherness. I am part of the DJ roster on most of the events and occasionally contribute to the magazine, so it was a pleasure to get involved when Ralph Tee asked me to put together a collection of tracks that would reflect the glory days of the Village. A chance to pay respects to the music, the DJs and most of all, YOU the punters, who made the Village what it was, what it stood for and why it is still revered today. Not such an easy project as you might think, as most of the huge records at The Village - Vivien Reed, Betty Swann, John Valenti, Corey Blake, the Spinners and many others have already appeared on countless other collections. So what we decided to do, was to include maybe 10 tracks from the 7ts that were massive tunes at the venue and then to supplement these with not only some tracks that appeared in the latter days before the closure, but also some that have appeared since, that retain the old spirit of The Village, and surely would have been 'Village Classics' had the old place survived. 'Across the board' was always the way to go at The Village, anything from any era could be played as long as it was considered quality, very much the Togetherness Weekender kind of feeling today. With 21 years to look back on, the collection could indeed be a box set and the sleeve notes a book, but if you want just a taste of what went on, then it's there for you, in TOGETHERNESS PRESENTS VILLAGE SOUL.